This was taken last night: Sam and Eddie dancing at the little pre-graduation party we put together spontaneously for her and her eleven family member who arrived in town yesterday afternoon. I don’t do spontaneous, but I don’t know what I wouldn’t do for Eddie (our former live in nanny/rock star), so it was easy despite my panic at the thought of her family looking at my kitchen floor. 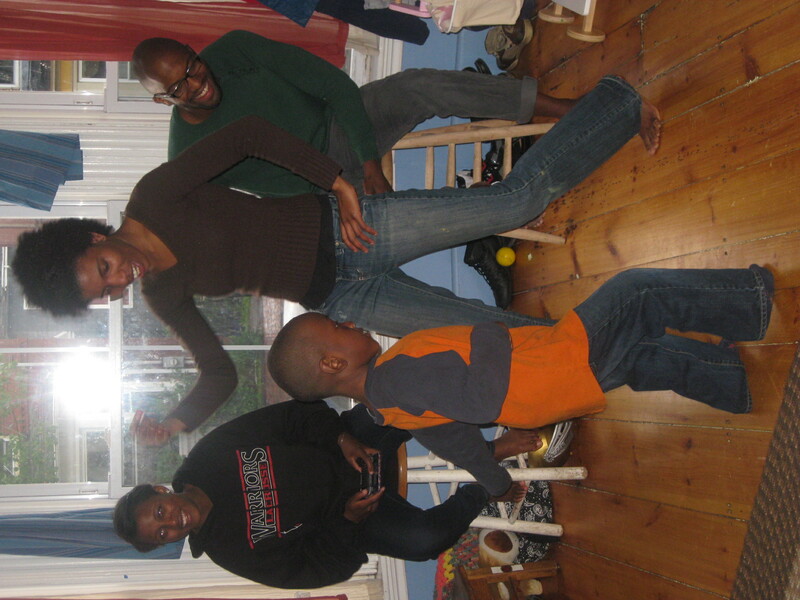 Uncle and I were in the racial minority, and Sam and Marcel were non stop entertainment. Eddie is a French born Haitian woman, who is the first child in her family to graduate from college. As mother’s day presents go-I can’t even imagine. This family has reason to celebrate large-and since Eddie was chosen as one of the three speakers to represent her class, and the only woman, I can’t wait to see the auditorium erupt as she steps behind the podium. After every one left, and we had had our bath, and our night-night snack, Sam, who was still high from the event, had an idea. We were talking about the card we sent his birth mom, when he asked if we could call her now. As I was getting my phone out, he asked what she sounded like. Uhhh. Like you really. Only an older, deeper, female version. He seemed content with that response. I prepped him a little bit, asking him what kind of things he wanted to say to her, or ask her, and what she might like to say to him. He had never asked to call her before. He had refused to talk to her the one time she asked (his fourth birthday). When it seemed like we were ready, I dialed. Although Tea didn’t answer the phone, her voice mail did. I held it to his ear, and watched his face. He seemed calm, searching. I added a little more love with Marcel’s help, and invited her to call us back when she felt so inclined. I want to encourage all of you who may be wrestling with how to have that conversation, either about or with a birth mom, a first mom, to push yourself a little closer in that direction as you feel able. Maybe it is something simple as; “Today is a day when we get to send love out to the amazing and beautiful woman who grew you in her tummy with such care…” or maybe like Sam, you will find yourself surprised with the urge, or ability to connect in real time somehow. Whatever it looks like, the intention is what is important. So feel great about whatever steps you make, or are considering in the days or weeks to come. Monday my piece about meeting his first mom in the hospital, a never before published piece, will appear on Fertile Source. I’ll add the live link when it appears. Monday will also feature my next Moms of Hue post, which will be about my Mom’s Congress experience in part. Happy Mother’s Day, Mama C! Thanks from all of us who are blessed by the way you do mothering as a transformative act: creative, engaged, dynamic, courageous and fierce. Your loving is a great blessing to your boys, and to the world. Really that description of my mothering is one I hold a mirror up to and shine back on the woman who wrote it!!! You are such a special person, and you have such a special family. People speak of unresolved childhood issues all the time, but somehow, I really don’t think that either Sam nor Marcel will have any, because you are doing something with your children that many parents are always so afraid to do, which is being completely honest! You are keeping things honest and open with them, which still gives them the freedom to figure things out on their own. Your parenting is creating a future where they will have few unanswered questions because their questions are being answered along the way. That is so amazing. YOU are so amazing. YOU are so inspirational. Parenting/mothering/single mothering is never easy, and parenting/mothering/single mothering a dynamic family like yours is no exception, but you are creating and applying as you go and its beautiful. So I read this, and I just burst into tears. What more can I say to you? It takes a mama to see a mama, and a single mama to reach down inside another single mama’s soul and wrap her arms around what she finds there. Thank you. Awww… now I have some tears welling up =). I really hope you had a wonderful Mother’s Day! Oh wow – that is so moving and adorable. It’s so hard. I wound up sending our weekly update with a final line of “We’ll be thinking of you with big hearts on Sunday.” When Theo can talk, we’ll need to make that transition to calling. Ironically, the birthgrandmother sent ME and Happy Mother’s Day card. Life is funny sometimes! Like your Mama? Now you can!